Fiona Nash made a statement to the Senate just before it rose on Thursday night for a fornight’s break. 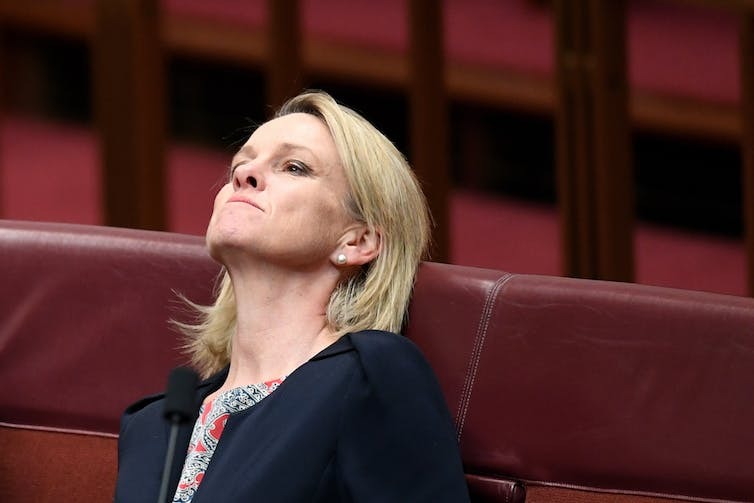 The government has been hit with another bombshell in the citizenship crisis, with the deputy leader of the Nationals, Fiona Nash, found to have dual British nationality. Nash made a statement to the Senate just before it rose on Thursday night for a fornight’s break. Her case will be referred to the High Court when parliament resumes on September 4. This means that both the Nationals’ leader, Barnaby Joyce, and his deputy will be before the High Court to determine whether they are ineligible to sit under Section 44 (i) of the Constitution, as will the Nationals’ former cabinet minister Matt Canavan. The section bans people with dual citizenship being elected. Coming as soon as parliament met on Monday and just as it adjourned on Thursday, the Joyce and Nash statements respectively bookended a disastrous week for the Turnbull government. Like Joyce and unlike Canavan, Nash, who is minister for regional development, will stay in cabinet, and will also remain deputy leader, while the court considers her position. Nash told the Senate that after Joyce’s statement on his dual New Zealand citizenship, she sought advice from the UK Home Office. By Monday evening she was told a caseworker there believed she was a British citizen by descent through her Scottish-born father. Her mother was born in Australia and was an Australian citizen; her father was born in Scotland in 1927. Her father died nine years ago, and her mother five years ago. “I was born in Sydney in 1965. My parents divorced when I was eight and my mother raised me. I had very little contact with my father throughout his life,” Nash said. She said an internet search revealed a host of websites saying that having a Scottish-born father allowed a person to apply for citizenship, while mentioning nothing about automatic citizenship by descent. She said the government had sought legal advice from the UK about her situation. This had been received on Thursday, and had been considered by a committee of cabinet late Thursday. Advice had been received from the solicitor-general shortly before she spoke. “I have just met with the prime minister and am taking this opportunity to make the Senate aware at the earliest possible opportunity of the position,” Nash said. Labor greeted Nash’s stated timeframe with some scepticism. She said Turnbull needed to explain why he was holding Joyce and now Nash to a lesser standard than Canavan, and not requiring them to stand down.